The government shutdown is affecting survivors and their ability to live safer and more stable lives. On top of the traumas they’re already dealing with, survivors say they’re afraid they won’t be able to meet their basic needs and keep themselves and their children safe, fed, and housed. Funding for SNAP, more commonly known as food stamps, will run out at the end of February. Families are already wondering how they will feed themselves and their children, especially since many food banks are already stretched thin. Federal funding for housing vouchers will run out in February, leaving survivors vulnerable to eviction. For many survivors a couple hundred dollars in vouchers is all it takes to keep them from becoming homeless or returning to their abuser. Fortunately survivors in our area, King County Housing Authority will cover the cost of vouchers for now. The closure of immigration courts affects survivors seeking U-Visas. These special visas help survivors of violent crimes (including DV) who work with law enforcement to help convict their abusers. If a U-Visa hearing is canceled because of the shutdown, survivors must way two or three years for a new one. Many may have no choice but to remain with their abuser for years. 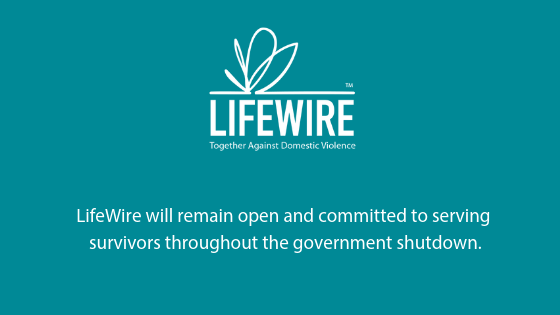 Survivors who have concerns about how the shutdown is affecting them can call LifeWire for help. We will continue to work with our many community partners to find additional resources for the duration of the shutdown. How do I know if my partner is gaslighting me?